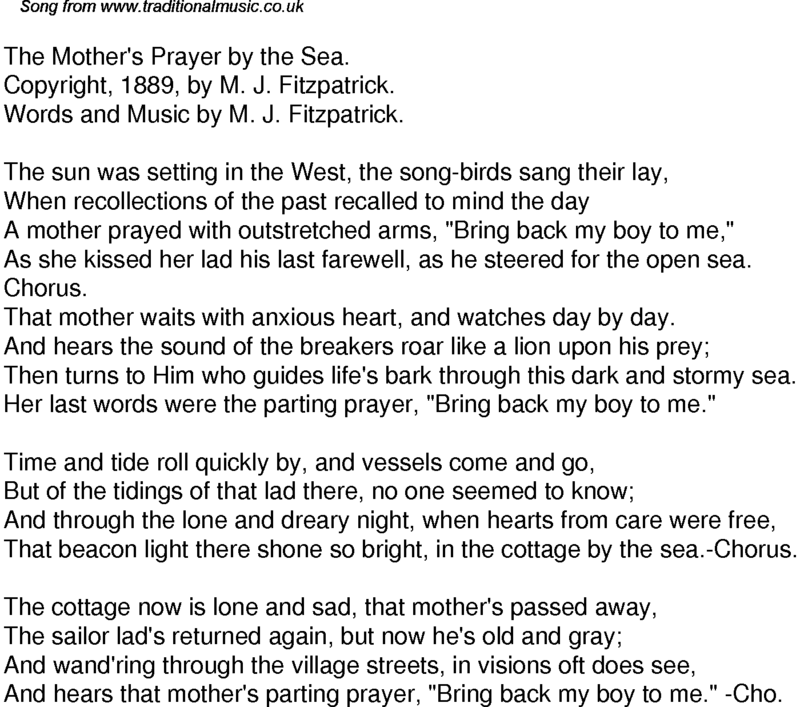 The Mother's Prayer by the Sea. Copyright, 1889, by M. J. Fitzpatrick. Words and Music by M. J. Fitzpatrick. A mother prayed with outstretched arms, "Bring back my boy to me,"
As she kissed her lad his last farewell, as he steered for the open sea. That mother waits with anxious heart, and watches day by day. Then turns to Him who guides life's bark through this dark and stormy sea. Her last words were the parting prayer, "Bring back my boy to me." That beacon light there shone so bright, in the cottage by the sea.-Chorus. And hears that mother's parting prayer, "Bring back my boy to me." -Cho.